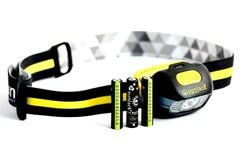 Does the SunJack come with a battery? Yes! 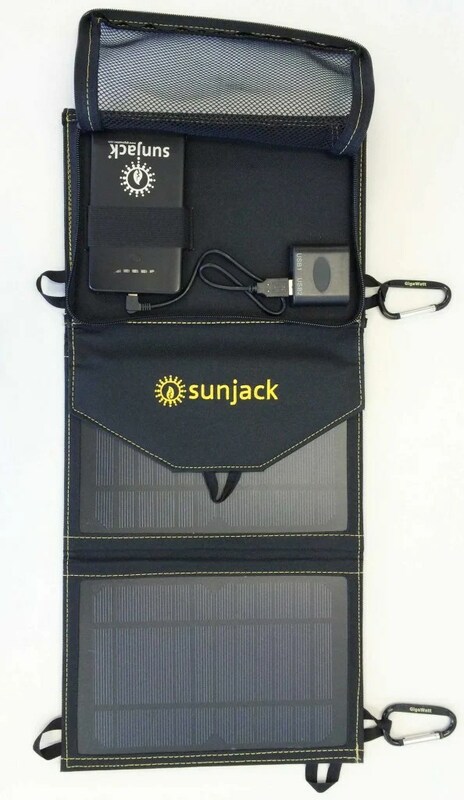 Each SunJack comes with battery pack that gives you power to charge your devices even when the sun isn’t shining. 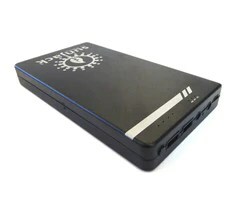 If you have your own portable battery, you can also use with the SunJack, but our battery is optimized for maximum charging speed from the SunJack. 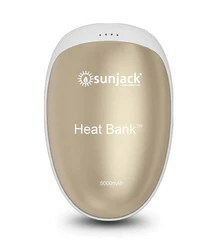 Can I charge the SunJack battery from a wall outlet? Yes! The battery can also charge from any standard micro-USB plug. This is useful if you’re going on a trip and want to have maximum charge with no down-time. The battery will reach a full charge in about 5 hours. How Much Power Does 14 and 20 Watts Produce? If you look at a standard Apple wall charger (http://store.apple.com/us/iphone/iphone-accessories/power), you’ll see that the small plug is 5 Watts, and the large plug is 12 Watts. The SunJack is more powerful than both of these! You want maximum solar power because the rating for a solar panel is only for direct sunlight. This means if it’s cloudy, a 5 Watt solar panel isn’t going to provide enough charge, but our 20 Watt solar panel will still have plenty of juice to spare (allowing for charging even under indirect sunlight or cloudy conditions). A Watt is a unit of power, which indicates how much energy can be transferred in a given second. Most solar chargers on the market (with our form-factor and portability) are less than 14 Watts. Most 20 Watt solar panels are not portable – they’re large, heavy, and rigid. And this is the peak power under direct sunlight, which means a 5 Watt solar charger in indirect sunlight may only produce 3 Watts of power – less than a small Apple plug. When it comes to solar, more Watts = more power! You can also think of Watts similar to horsepower or CPU speed. You can still get the work done on lower horsepower/CPU speed/less Watts, it will just take longer. With 14 and 20 Watts of solar power, there’s ample power to charge your devices, even with clouds. If you’re wanting wall-outlet charging speeds of up to 2 Amps of current, you’ll want as much power as possible. Fortunately with the SunJack, even if there’s no sun you’ll be able to rapidly charge all your devices with our battery. What is special about your USB ports? Our solar USB ports provide a full 2 amps of output – which means the 20 Watt SunJack could charge 2 iPads at the same time under direct sunlight! Our battery also is able to take in a full 2 amp charge from the solar cells, and discharge a full 2 amps – which allows for very rapid energy storage unlike anything else available. Simply put, our USB ports allow for maximum fast-charging of any device. Can I charge directly from the SunJack instead of the battery? Yes! 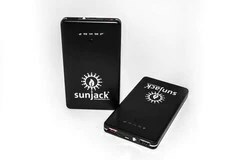 Each of the SunJack USB ports provide up to 2 Amps of output, so you can charge directly from the power of sunlight. If it becomes cloudy, simply switch over to the battery for continued charge. 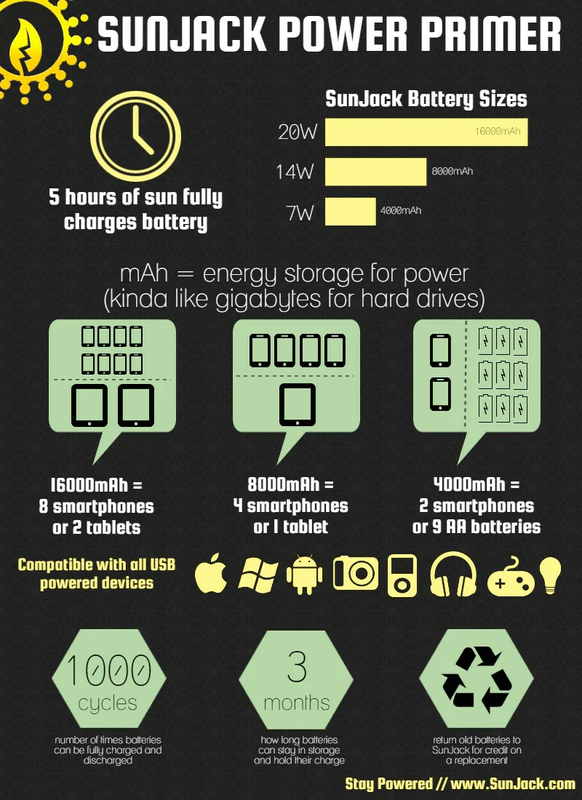 What is your solar cell efficiency? What’s the difference between thin-film, poly-crystalline, and mono-crystalline solar technology? We use monocrystalline solar cells in the SunJack, which are the highest efficiency and longest lasting solar photovoltaics available. Monocrystalline solar panels are typically warrantied for 25 years due to their durability and reliability. Polycrystalline is less pure than monocrystalline and has lower heat tolerance, but is cheaper. If you’re installing solar over a large area and spending tens of thousands of dollars, it may be a better option to save with polycrystalline solar panels. Thin-Film is the least efficient, usually around 10%, and degrade the fastest, but is the cheapest option, and useful for certain applications where weight and flexibility are critical issues. How durable are your cells? Strong enough to be dropped on concrete, stepped and jumped on, and even run over with a car! 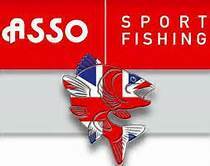 Check out some durability videos here. SunJack is weather-resistant, meaning if you leave it out in light drizzle it’ll be fine. However if you plan to leave it out in heavy rain we recommend purchasing one of our weather-proof sleeves for $5.